The Big Bottle Tour, by Annett and the Boomerang Alliance Team! "I used to be a telecom engineer and got to work in different countries. But wherever I lived, I was drawn to and fascinated by our oceans and the many amazing creatures that live there. 15 years ago, I decided to make this passion my profession. I studied marine ecology and came to understand that human impact goes further than overfishing and loss of habitat. Our oceans are drowning in waste, most of it plastic. That plastic never goes away, it just breaks up into smaller and smaller pieces, which when ingested by animals can transfer toxic chemicals, many of which have been found to magnify up the food chain. The scale of plastic debris is simply staggering and cleaning up is not a solution. I wanted to do something to stop this at the source, on land. 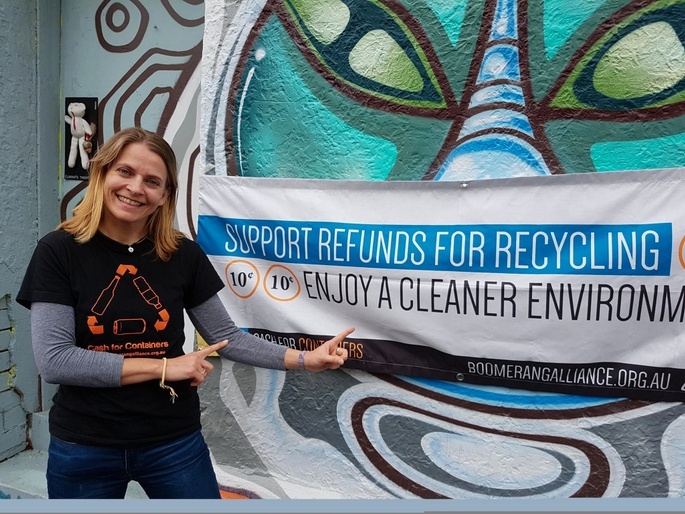 I joined Boomerang Alliance, an Australian not-for-profit group working to reduce marine plastic pollution. We lobby governments, work with industry and educate communities on issues such as single-use plastic packaging. I’m their sole Victorian representative and have been campaigning for 18 months for a container deposit scheme. Drink containers are one of the biggest contributors to plastic marine debris. The CSIRO found that containers are three times less likely to be littered in areas with a container refund scheme. It’s easy really: put a value on it and it doesn’t get tossed! Victoria and Tasmania are the only states that have yet to commit to such a scheme. The scheme is also great for providing funding for charities and community groups. It’s easy to convince people of why this makes sense, but it’s sometimes hard to be heard over the dim of other issues taking up space and time. So, I decided to go BIG… enter the Big Bottle, which I want to tour around regional Victoria. I put out the call and have already received many offers of help with setting up meetings with MPs, talking at schools and doing clean-ups. The best part of my job is working with all these local waste heroes and I can’t wait to meet them! Together we can push this sensible scheme high up on the Victorian government’s agenda. Let’s just hope the Big Bottle makes it all in one piece ?"